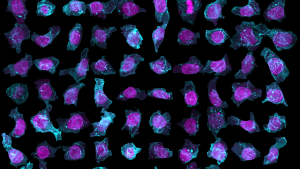 If doctors see how cancer changes specific cells, they can find better treatments to fight it. The model shows what a typical human induced pluripotent stem cells (hiPSCs) might look like (they chose hiPSCs because they were cloning them as they tagged different structures within them). To train the AI that generated it, the researchers took detailed scans of thousands of cells — their online tool, which is free and open to the public, offers 3D views of 32,000 cells. Editor’s note, 5/9/18 5:32 PM EDT: This post originally stated that the researchers had made a model of embryonic stem cells. They had, in fact, used hiPSCs, which are derived differently. The article has been updated. We regret the error.